Islamic depiction of Iblis, Satan, from the 14th century manuscript 'Kitab al-Bulhan' (Book of Wonders) by Abul Hasan Al-Isfahani. Notice Iblis' hand gestures. 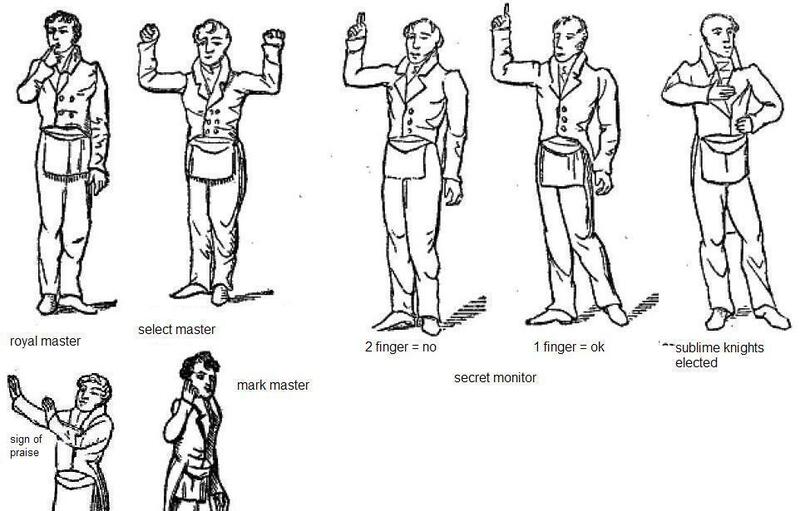 The following is an excerpt from the German book “Freimaurersignale in der Presse” or “Freemasonic Signals in the Press”. Iranian President Mahmoud Ahmadinejad’s scathing attacks against Israel and his repeated denials of the Nazi Holocaust could be motivated by a desire to conceal his own Jewish roots, an Iran expert told The Daily Telegraph on Saturday. The British newspaper examined the Iranian leader’s identity card which he displayed in public during his country’s elections in March 2008. The ID card bears his family’s original surname, Sabourjian, which is a Jewish name that means cloth weaver, according to The Daily Telegraph. The Sabourjians have historically been concentrated in the same region of Iran where Ahmadinejad was born, according to the report. Ahmadinejad’s identity papers indicate that his family changed its name and converted to Islam after he was born, the British newspaper said. Iranian observers suggested that the president’s constant verbal assault against Israel and Jews may be an attempt to prove his loyalty to Shia Islam while making every effort to hide his Jewish past. (IsraelNN.com) The son of a leading Iranian authority accuses the Iranian President of changing his Jewish name. Several Iranian media sources are quoting Mahdi Khazali – the son of a leading supporter of Iranian President Mahmoud Ahmadinejad – as having written in a blog that the president has Jewish roots. So reports the Hebrew-language Omedia website and Radio Free Europe. Khazali, son of Ayatollah Abu Al-Kassam Khazali, says that Ahmadinejad changed his Jewish name on his ID card in order to hide his roots. Khazali the son says that the president hides his Jewish roots by attacking Israel and the Jews, and by expressing strong Muslim religious beliefs. A record of the name change still appears on the president’s ID card, however, says Khazali. His old name was Saburjian, and he hails from the Aradan region of Iran. The accusations appear in an article Khazali wrote entitled, “The Jews in Iran.” He says the time has come to “reveal the truth” about the Jews’ role in Iran. Also look at this image. It shows the masonic handshake. 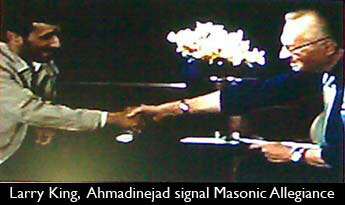 Ahmadinejad is crypto jew, freemason and a Zionist Agent. he is a MI6 Agent. WE ARE DROPS AT THE MOMENT BUT WE ARE THOUSANDS OF BILLIONS OF DROPS.WE WILL JOIN AND FLOW AN UNSTOPABLE OCEAN THAT WILL DESTROY ILLUMINATIES AND THEIR CURROPT SYSTEM WHICH IS TRYING TO DESTROY MANS WORLD AND FREEDOM.NOTHING CAN STOP US.TIME IS VERY SHORT.THE DEADLINE IS 21/12/2012.THATS WHEN EVERYTHING ENDS.ACT NOW.NO MATTER WHAT RELIGION WE ARE ALL HUMAN&WE HAVE THE SAME GOD. 1. A reformer who wants to increase people’s social freedoms and end corruption. 2. A hardliner who wants to pursue nuclear power and brand Israel as an illegal regime that should be overthrown. 3. A reasonable person open for dialogue among civilisations on an equal basis. And lots more!! How can he be ALL of these? It all depends on what audience he is pleasing!! 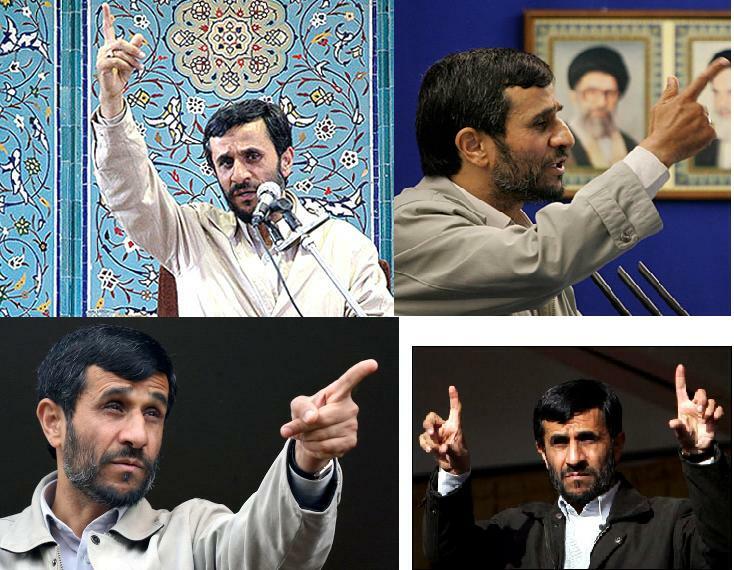 Ahmadinejad is first and foremost a politician who gives the audience what they want to hear. Like all politicians, he probably does not mean half of it and has no intention of ever doing any of it!! It is all effect, diversions and so on and oh so repetitive. Rafsanjani and Mousavi, ironically Ahmadinejad’s rivals, actually came up with most of those anti-Israel cliches. And Saddam Hussein too. A funny template for Iranians but an Iranian politician can seen that they can fill the void left over by Saddam’s demise all the while secretly doing deals with the West as well. 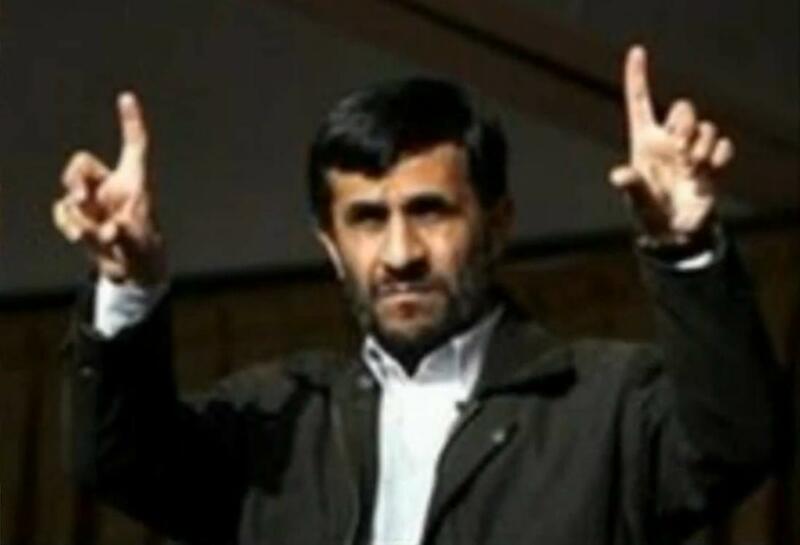 Ahmadinejad is two-faced and so is Ali Khamenei. That’s why this regime has survived as long as it did. It can divert attention away, can drive hard bargains and can say contradicting things that will please both anti-US Islamists and the US at the same time!! 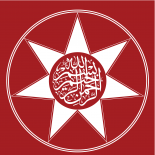 This entry was posted on February 15, 2010 by ASFC in Political Leaders and tagged Ahmadinajad, Ahmadinajad Jewish, Ahmadinama, Ahmadineajad, Anti-Semitism, Bush, conspiracy theory, dangerous, Freemason, Iran, Mason, Masons, War.